Indian Fry Bread batter is a four ingredient bread that fries up crunchy and crispy on the outside while light, tasty, light and tender on the inside. In a large skillet over medium heat brown ground beef. Drain any excess grease. Add taco seasoning and water; simmer for 5-10 minutes. 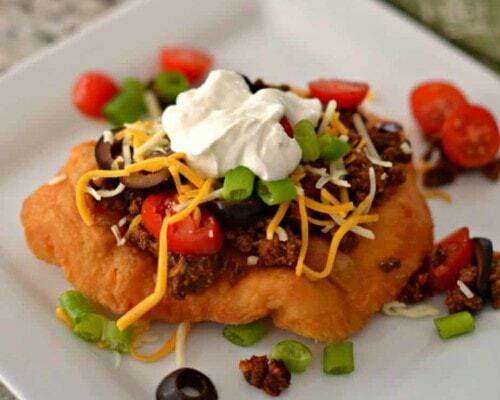 Spoon on top of fry bread, sprinkle with cheddar cheese, tomatoes, black olives and green onions. Top with sour cream and serve immediately.